Salvia hispanica L., a grain commonly called chia, has remained generally unknown to most of the world as a nutritional commodity until recently. Sometimes referred to as Mexican chia, black chia, or Spanish sage, it came into public view in the U.S. with the Chia Pet, a fad that began in 1977. However, it has been an important part of the agricultural industry in Argentina for many years, making up 24% of their annual crop. It’s a native to Mexico and northern Guatemala and is believed to have been a staple in Mayan and Aztec diets dating as far back as 3,500 BCE. In fact, the word “chia” translates from the Mayan as “strength”. Seeds were not only consumed by warriors but were used as medicine, and they were given as tribute and to pay taxes to Aztec priests and nobility. So why did this important food fall out of favor? After the Spanish conquest, chia was banned by the conquerors because it was believed to be connected to the Aztec religion in which seeds were offered during rituals, an act that clearly went against what the Spaniards believed was the one “true” religion – Christianity. In the U.S., Native Americans used the seeds of the golden chia or Salvacomumbariae for vitality, and in Asia, Salvia miltiorrhiz roots are part of nature’s “medicine” cabinet. Chia is a gluten-free annual that makes up 4% of all the grain grown around the world, and these tiny seeds are being esteemed for their exceptional significance to our health.As a commercial product, chia began as feed for horses, giving the animals superior energy, but the nutritional impact for humans has given them a place in cooking oils, supplements and a variety of recipes. How can chia seeds benefit you? Chia seeds are high in protein, and a remarkable 75% of their total weight is omega-3 fatty acid. This represents a huge benefit for the heart, lowering the risk of stroke and other cardiovascular diseases as well as reducing triglycerides, blood glucose levels, and inflammatory markers. They contain amino acids and the antioxidant flavonoids, chlorogenic acid, caffeic acid, myricetin, quercetin, and kaempferol, the latter two showing encouraging effects in the prevention of bone loss for aging women. The dark chia seed variety also contains antioxidant levels equal to dark berries such as blueberries. Chia contains B vitamins, phosphorus, iron,zinc, and copper, all necessary in preventing hair loss and scaly skin. Omega-3s linoleic and alpha-linoleic acids along with protein content work to foster cell and tissue growth in nails, skin and hair. High fiber content makes you feel fuller faster and longer. Drinking a mixture of chia seeds and water (or other beverage) for two months will cause you to lose weight naturally even if you suffer from metabolic syndrome. Caution: A gel will form quickly and could block the esophagus, so it’s best to drink very small amounts at a time or presoak seeds in soup and take it that way. Chia seeds are hydrophilic. They can absorb 10x their weight in water so they are extremely effective at hydrating the body, improving stamina, performance, and endurance. 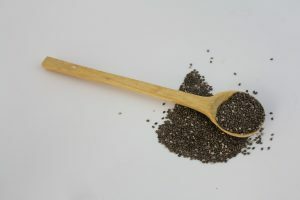 Chia can replace lost nutrients including 5x the amount of calcium found in milk (particularly important for skeletal development in the last trimester), phosphorus, manganese, copper, zinc, iron (critical for transporting oxygen to the baby’s blood) and niacin, plus boron, another mineral crucial for bone health. Raw on salads and in dressings, in smoothies, and in yogurt, cottage cheese or cereal. Lightly warm it for pasta sauces. Use it directly on your skin, hair and nails or use it as a carrier oil blended with organic essential oils. The oils in chia seeds also contain a natural insect repellant. You can purchase chia seeds in most health food stores or online, and many supermarkets now carry them. You can also purchase them in other products such as cereals, health bars, and baked products. Look for a raw organic product from a sustainable grower. Do not swallow dry chia seeds, whole or ground then drink water. The gel may form in your esophagus causing critical blockage that will require medical intervention. Do not give dry chia seeds to children. Too much chia may cause constipation or hard stools, bloating or intestinal gas. Limit your intake to 1-2 tablespoons dry seeds per day and start slowly with 1/4-1/2 teaspoon per day. Seeds should be taken presoaked in liquid or cooked in food. Chia seeds can lower blood pressure. Consult with your medical professional if you are taking blood thinners or blood pressure medication. Chia seeds regulate glucose levels. Consult with your medical professional if you are taking drugs to control blood sugar. Allergies to chia are rare, but if you experience rashes, hives, watery eyes, trouble breathing, vomiting, diarrhea, or tongue swelling, you may be allergic to chia.